Nitrate supplements are an exciting emerging line of sports nutrition supplements based on new discoveries about the ability of nitrates to act as precursors of nitric oxide (NO). Such discoveries have helped explain the improvement in performance seen when consuming large amounts of beetroot juice; one of nature’s highest sources of nitrate. As discussed in our article on nitric oxide supplements, nitrate is converted to nitric oxide via nitrite in the body. This pathway has been referred to as the nitrate-nitrite-nitric oxide (NO3--NO2--NO) pathway in order to differentiate it from the more commonly known L-arginine-nitric oxide synthase-nitric oxide (L-Arg-NOS-NO) pathway. The key to this new pathway is the anaerobic bacteria that occur naturally in human oral cavity. As it turns out, the body has no mechanism, other than the unique enzymes in these oral bacteria; to convert nitrate to nitrite. These findings are very significant in the context of modulating body nitric oxide levels, especially when one considers that green leafy vegetables (i.e. spinach, lettuce, and beetroot) are the major source of dietary nitrate. As the diagram below shows, part of the nitrate (i.e. 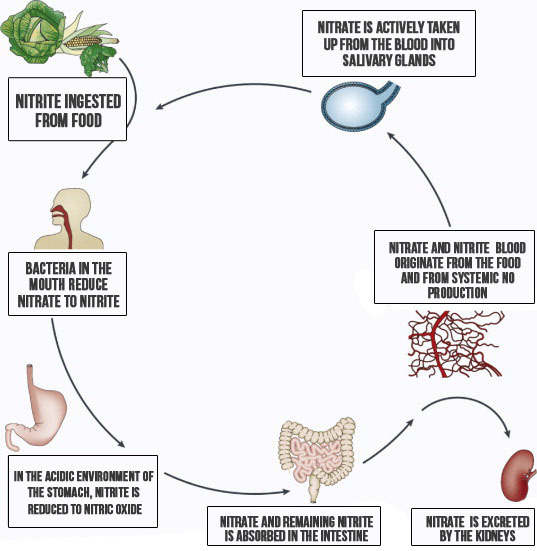 up to 25%) that is ingested from dietary sources is actively extracted by the salivary glands and concentrated in saliva, where commensal facultative anaerobic bacteria reduce nitrate to nitrite. This new discovery of an alternative pathway for generating nitric oxide has seen the evolution of a number of new supplements designed to deliver different forms of nitrate to boost nitric oxide. Some manufacturers have set out to offer popular amino acids such as branched-chain amino acids, creatine and arginine in nitrate form; said to make the amino acid more bioavailable while at the same time providing a source of nitrate. The other approach has been to make supplements containing concentrated vegetable sources of nitrate, with the most popular being beetroot. However, it’s worth noting that spinach and lettuce are also good sources of nitrate. Lastly, the simplest approach is to provide nitrate in the form of synthetic sodium nitrate or potassium nitrate. Because of the critical role that oral bacteria play in the conversion of nitrate to nitric oxide, users of nitrate supplements are advised to abstain from mouth washes, which actually reduce the numbers of beneficial bacteria that carry out the all important conversion of nitrate to nitrite. Another factor that can influence the level of nitrate in vegetables is the soil content of nitrate in which the vegetables are grown. Lastly, one other factor to consider is the average time taken for nitric oxide levels to peak after nitrate supplementation. Most studies show it takes around 3 hours, which is significantly longer than other common pre-workout nutrients. Lundberg JO & Govoni M. Inorganic nitrate is a possible source for systemic generation of nitric oxide. Free Radical Biology & Medicine. 2004;37(3):395–400. Bailey SJ, et al. The nitrate-nitrite-nitric oxide pathway: Its role in human exercise physiology. European Journal of Sport Science. 2012;12(4):309-320. Bescos R, et al. Sodium nitrate supplementation does not enhance performance of endurance athletes. Medicine and Science in Sports & Exercise. 2012;44(12):2400-2409.